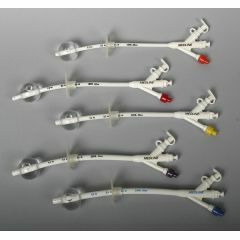 Made of 100% medical-grade silicone, these Gastrostomy Tubes have a rounded tip for easy insertion and a closure cap to seal tube between feedings. The translucent circular skin disk easily adjusts to maintain proper tube position and allow stoma observation. Gastric balloon expands evenly with sterile water or saline solution for a secure, comfortable fit. The 3-port G-tube has a convenient third port that eliminates the need for a Y-site connector. Enjoy time and cost savings, while avoiding the wear and tear on the port from frequent connecting and disconnecting of the feeding set. The tube would be fine IF the stopper were longer!! It pops out of the tube and fluid goes every where, all over the patient and the bed. I HATE THESE TUBES!! The product is cheaper than other website. The shipping was so faster. The product is good. Your service is amazing. Thanks! I use it to replace my feeding tube. I like its flexibility, but not the 3 ports that makes it big and uncomfortable because most time the the port on the left opens itself. Quality item. Quick delivery. Highly recommend. Is gauge 22Fr. bigger or smaller than gauge 24? FR stands for French catheter scale. So, 22FR is smaller in diameter than 24FR. yes, the center port is for feeding....the smaller port is for meds delivery and the colored port is for inflating the balloon with sterile water once the G Tube has been inserted to keep it in place. Hope this helps.